What an enjoyable tour! And you look terrific in the dress. What a stunning outfit. The cut and shape really suits you and the Barbican is lovely. Thanks for sharing. What a treasure! That was soooooo much fun, Rhonda! I, too, enjoy immensely a nice long look-see at the construction of a beautiful vintage garment. Amazing. How fun was THAT to wear that gorgeous suit! Mmmmm! All those hidden details are what make a timeless outfit. I never knew about bra strap clasps or the one at the waist. You don't see those used these days, especially not in factory-made clothing. There is a bridal store and a high-end women's fashion store in my neighbourhood. Not needing such attire, I have never been in either. Now I want to look at the construction so I will go in and introduce myself. Thanks Rhonda. Rhonda, thank you so much for sharing the exquisite detail of your cocktail suit. Many details of the construction will be in mind as I sew my next garment. Hand sewing hem to lining, nice detail. Inside belt to hold the dress in place, wonderful. Treating lining with fabric for ease in making adjustments, wow, what a wonderful technique. Your sharing of this treasure is much appreciated. Thanks for being so generous with your antique treasure!!! Your suit is beautiful. Thank you for sharing it with us. 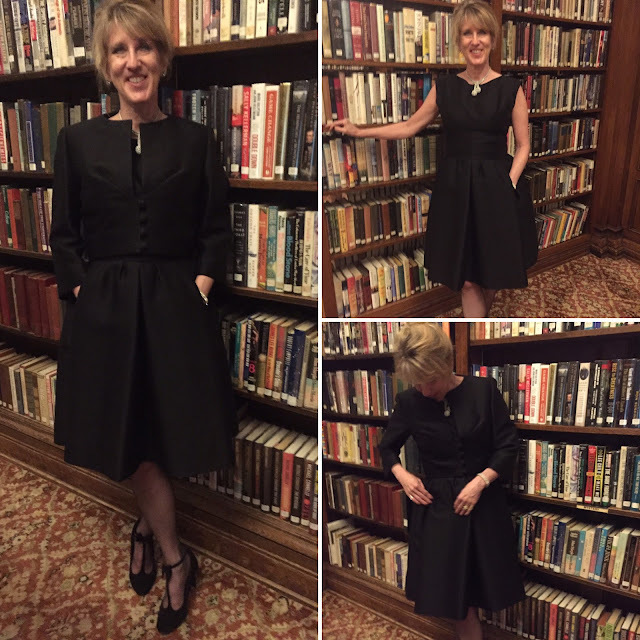 Rhonda thanks for sharing this exquisite cocktail dress, it's really beautiful and looks smashing on you. Your video showing the inside views is a treat, the lining is fun! I got about half way through but have to head out for teaching, such detail and spacious seams. Thanks again! Our store in Portland was Meier & Franks. I still miss having a department store where you could buy special occasion clothing - with in-store alterations. Lovely tour of your vintage dress and jacket. Thank you. Thank you for this fun video. I loved hearing all about it. You look stunning in it!